By now you’re probably aware of my love of sweets with brown sugar, especially the Brown Sugar Cookies. So when I saw Bake or Break post about these cupcakes, it was a no-brainer. I was a little nervous because the recipe is from Martha Stewart, and I’ve made some recipes of hers that left a lot to be desired. Fortunately, this recipe rocked! 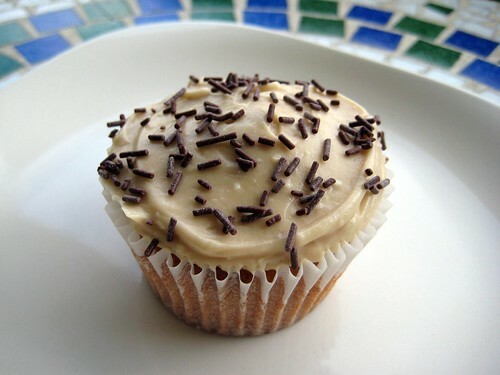 While the cupcakes are dense, they’re soft, moist, and have an amazing caramel flavor. The frosting has a tang from the cream cheese, and the brown sugar gives it a a nice sweetness. Preheat oven to 325°. Line standard muffin tins with liners. Using an electric mixer on medium speed, beat butter and brown sugar until pale and fluffy. Add eggs, one at a time, beating well after each addition. Add flour mixture in three batches, alternating with buttermilk. Beat until well-combined after each addition. Fill lined cups 3/4 full with batter. Bake 20-30 minutes, or until a wooden pick inserted in the center comes out clean. Cool on wire racks 10 minutes then remove from pans to cool completely. Using an electric mixer on medium speed, beat butter, cream cheese, and brown sugar until smooth. Frost cupcakes immediately, or refrigerate frosting for up to 3 days. After refrigerating, bring to room temperature and beat on low speed until smooth. Note: I’m lazy and didn’t want to put the frosting back in the mixer and wash another bowl, so I used the egg beater that OXO sent me. It was easy to use and even easier to clean, and it can go in the dishwasher! Stay tuned for your chance to win one here. I love sweets. Just want to make something tasty. Thanks for the recipe. This recipe looks really good. I am going to try it out for SuperBowl Sunday. I am always looking for new dessert recipes. Thanks for the recipe. @Tiff & Ash – Report back and let us know what you think!